Kemi Adetiba’s King of Boys is a coming of age film and a departure from the mundane theme of comedy prevalent in Nigeria’s movie space. King of Boys is a movie of grit, dialogue and character, laced with auteur brilliance intent on making a strong statement in Nollywood. The movie begins with a party scene – a gathering of the high and mighty – politicians, celebrities, musicians, etc, dining at the behest of Alhaja Eniola Salami (Sola Sobowale). The trappings of such a high calibre event is relatable: Seyi Law is the compere, KWAM 1 is performing and dollars are sprayed. But this is no Wedding Party, Alhaja Eniola Salami is having a birthday bash. Eniola delivers a vote of thanks, mouths something about being a person of few words then proceeds to attend to an urgent issue. In the following scene, we are introduced to who Alhaja Eniola Salami truly is: The King. This poignant introduction to the character of Eniola Salami begins the roller coaster into King of Boys. Adetiba explores a variety of themes providing viewers with the option to cherry-pick. The unassuming takes the bait of the apparent crime and punishment drama but beneath the surface lies Adetiba’s angst with illegitimate election financing, politics and corruption in the Nigerian society. And these are some of the issues she’s brings to the fore. There is a brewing tension between Salami and Makanaki (Reminisce), a rival under-boss gunning for the king’s crown. Reminisce delivers a compelling performance reminiscent of Sonny Black’s (Michael Madsen) coup on Sonny Red in the 1997 crime drama, Donnie Brasco. He considers the idea of going it alone, away from the shadow of Salami and plots her dethronement. This battle for supremacy was never going to be a fist fight like Killmonger and Black Panther but Makanaki and Salami understand that the duel would leave only one man (or woman) standing and both parties deploy all their resources – human and diabolical. Salami is King and her goons on the streets deliver the opportunity to end Reminisce’s travesty early in the tussle. Salami does the unthinkable, an antithesis to the 15th Law of Power, a decision she would live to regret as the movie progresses. There are other battles that draw Salami in – a fallout with the political class is one that leaves casualties in its wake and a scuffle for approval between her own children, Kemi Salami (Adesua Etomi) and Kitan Salami (Ademola Adedoyin). Interestingly, Eniola’s choice of Kemi as her protégé is a win for feminism and a strong argument for a shift from patriarchy as we know it. Was this deliberate by Adetiba, being a female director or was it just convenient? The question is left unanswered but Adetiba tries to resolve other questions the viewer might have: one of which is to reconcile Salami’s character and how she slithers through being an effective pitchman in a sales store and ruthless gangster on the next turn. How exactly did Eniola become this savvy and ruthless? Adetiba answers this by thrusting the cinema goer into several flashbacks where Toni Tones plays a younger Eniola Salami finding her feet in the world of crime. Toni Tones justifies her casting and leaves the viewer eager for more. Adetiba asks questions of her own and pokes sticks into the face of the political elite as she raises the dust on past political events. The scene where armed guards leave their duty post “to purchase food” is a stark reminder of events that led to the assassination of a former Attorney General and Minister of Justice, Chief Bola Ige in December 2001. King of Boys works on many scores and the use of proverbs enriches the “African content” and may attract viewers who are drawn to such nuance. 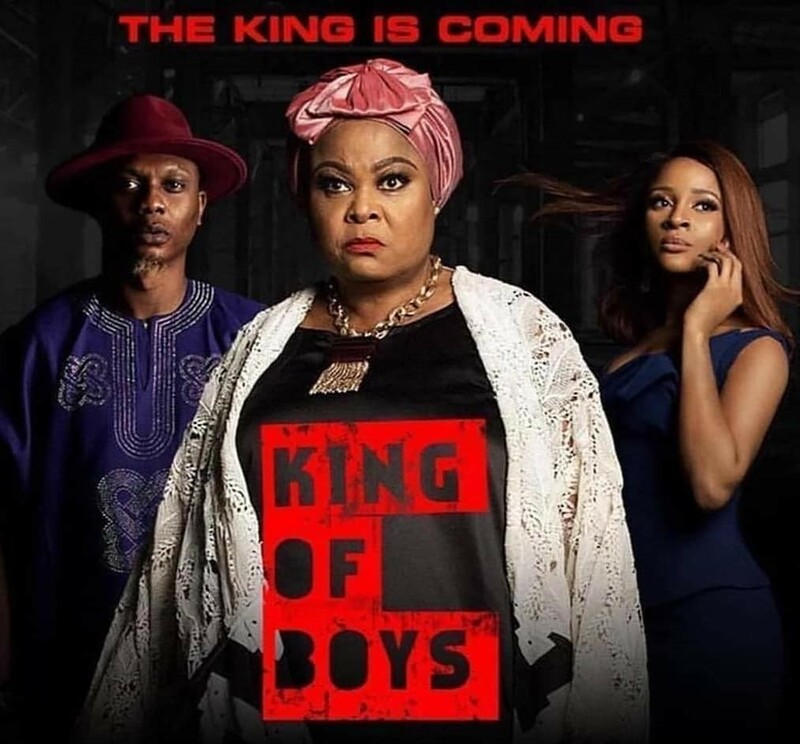 King of Boys was centered around protagonist – Eniola Salami, and that may well be one of its pitfalls as other characters (except Reminisce and Toni Tones) struggled for screen time. Kemi Salami (Adesua Etomi) was pitched to play a more dramatic role as the natural heir to the throne but when the moment came for her to take the reign the overall consequence of her actions proved insignificant. Sola Sobowale’s acting has never needed any affirmation and she brings her genius to play with her portrayal of a mob boss. To many she is no different from Frank White (King of New York), Frank Costello (The Departed) or Frank Lucas (American Gangster), and when she says she would do you harm, we know she means every word. Sola Sobowale is King!